After riding out to Almonte, then riding the Roubaix course hard, I'm tired, so I'll hold off reporting on that until tomorrow, and just convey the info about Dave's final stage of the Cape Epic for now. I don't have much to say about today's stage, because, frankly, I don't have time to read up on it, but at just under four hours, I suspect it was no ride in the park. Dave and Brett managed to secure 16th overall in the Masters category, just about 9 minutes off 15th, which is no small feat. And Dave is indeed the top placing Canadian. Finishing this race alone is a massive achievement; I am proud of Dave for taking on the challenge and riding strong start to finish. Chapeau. Hopefully Dave will have enough energy to write a few words about his experience once he's back home. It's the same every year - the last day of the Absa Cape Epic might be short but it is never easy. Old Viljoens Pass and Nuweberg reminded the remaining 1 064 riders that it wasn't over just yet. Dr Evil had warned riders of a final few surprises before a traditional finish at Lourensford Wine Estate. There they were reunited with their loved ones - a life's task accomplished and an experience they'll never forget. 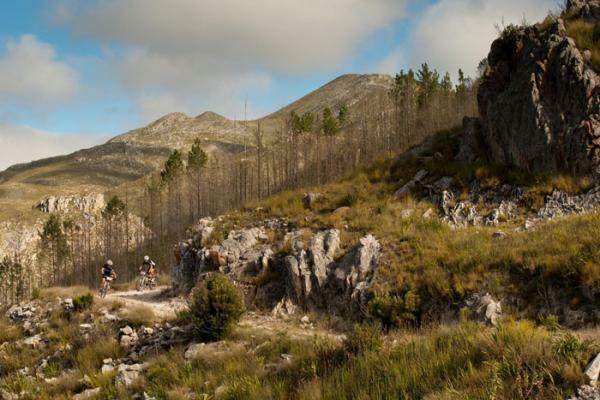 This year's route took riders through some of the most breathtaking scenery thanks to Cape Nature Conservation.